2018 DARE Art Prize winner Samuel Hertz, following a year of research, will present his final performance for the DARE Art Prize in the Howard Assembly Room this summer. It will include electro/acoustic pieces for small ensembles, video, live electronics, performance and mixed-media installations focusing on contact with industrial and natural infrasound as a way of illustrating complex relations between humans and environments. 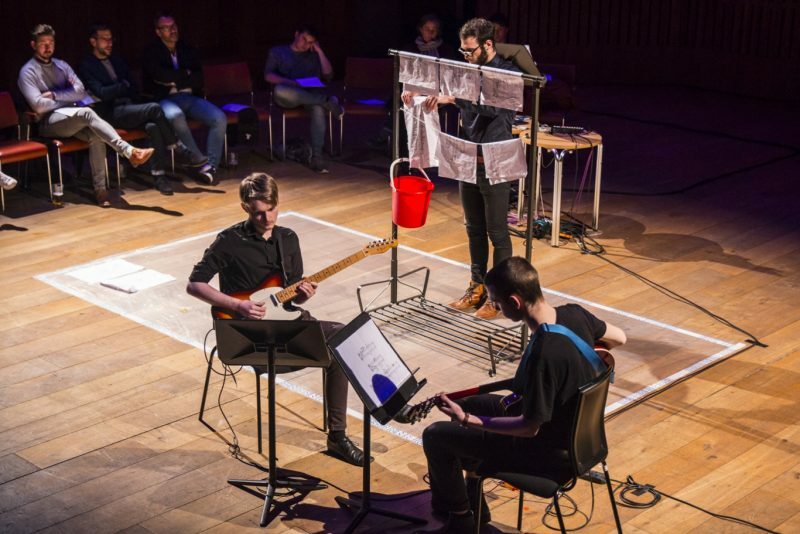 On 28 February he performed a new piece, Immersion, at the end of his month-long residency at the Tetley in Leeds, a dance piece involving subsonic frequencies and wine glasses filled with water. On 24 February in the Howard Assembly Room Samuel performed a new work continuing his engagement with sound and ecology. Influenced by spectralism – a compositional technique that employs the computerised analysis of sound – Gunslinger is ‘transcribed’ from a field recording of water melting from a cliffside ice sheet, for two guitars swathed in reverb in the manner of a classic, widescreen Western soundtrack. Composer and lecturer at the University of Leeds Dr Scott Mc Laughlin also presented a new work for electronics and clarinets. Fragility uses electronics to transform data on the unstable ecology of Burkina Faso into sounds, which slowly distort as the climate data moves out of the stable range, while the musicians – playing complex and delicate chords that are only stable under the right conditions of breath pressure and control – attempt to keep pace with the changes. Read Neil Mudd’s piece for the Culture Vulture here.